Fracking: it’s not just our national parks that need protecting, but our houses too. Today the government has announced that fracking will only be allowed in national parks and areas of outstanding natural beauty under “exceptional” circumstances. That’s not, despite what some news outlets are reporting, a “ban”. There is, however, an even more important conclusion to be drawn from today’s announcement: that the government has been forced to concede, again, that fracking is a damaging, risky operation, something from which our most delicate areas need to be protected. But if our richest habitats have to be protected from it – as they do – then your house and community should be too. This is the second time that the pressure from campaigners has forced a government concession. It was only in January that the government announced bribes for communities that accepted fracking: the first concession that communities would be suffering harm for which they’d have to be compensated. The fact is there are numerous local environmental risks associated with fracking, certain risks which have been highlighted by both the limited drilling which has taken place in the UK and the growing body of evidence of environmental and health impacts from the US in particular. There’s the certain harm of large numbers of lorry movements. That traffic problem was what led the West Sussex County Council to last week turn down the proposed Wisborough Green fracking site. (We’ll have to see how Eric Pickles demonstrates the government’s “commitment” to localism when he gets to review that decision). Then there’s the certainty of heavy water consumption in the fracking process, when we know large areas of Britain are regularly suffering water shortages. Water contamination caused by the fracking process is another sometimes under-reported environmental risk. Then there are the earthquakes. Small, certainly, but not generally an attraction to an area. We like to think that the ground under our feet is solid and secure. Put these risks together and you can guarantee damage to industries: certainly tourism. Water contamination from fracking threatens agriculture. The second group are the risks of damage: of surface spills of chemicals and oil, of contamination of aquifers, of the generation of large quantities of low-level radioactive waste. We’re told Britain will have far better regulation than the US – where a “wild west” mentality runs in many areas – but this is an industry that developed its practices and cultures there. So certainly, it’s clear that national parks and sites of outstanding natural beauty should have complete protection from this threat – but so too should your house and community. Today’s ruling means that many people’s houses and communities, in some of the richest areas of the country, will be protected. 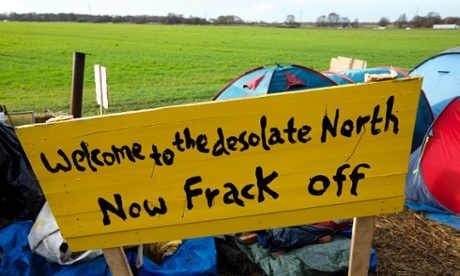 It’s going to be roughly the “desolate North”, in the terms of Lord Howell, the poorer and less environmentally advantaged areas of the country, that this ruling will push fracking towards. Just as poorer east London had to live with the noxious fumes blown from the industries of the centre by the prevailing winds, so poorer communities are going to be at greatest risk of having fracking dumped on their doorstep – and burrowing under their foundations. Despite the bribes, those areas are resoundingly saying “no”. We saw that clearly at Barton Moss, where campaigners were stout in their defence of an area no one could call an area of natural beauty, sandwiched between major roads and an airport. As recent polling has demonstrated, there is very little public acceptance of fracking. And there is no certainty that there ever will be any fracking in Britain, even were there to be government and public acceptance. It’s worth repeating the words of Lord Browne, boss of Cuadrilla, that it will take five years to show if fracking is viable in Britain. How often have you heard prime minister, David Cameron, or chancellor, George Osborne, talk about energy conservation and renewable energy generation, versus the times they’ve spoken about fracking? They’re distracted by this 20th-century dinosaur source, a magic bullet solution to their failure to develop a sensible, viable energy policy for Britain. In pushing forward with their fracking fantasy, Cameron and co are riding roughshod over the climate science which overwhelming indicates that 80% of known fossil fuel reserves need to be left underground if we are serious about meeting internationally agreed climate commitments. Instead of adding to the huge financial risk of the carbon bubble, as fracking would, we know the answers; we have the renewable and conservation technologies to build an energy policy that breaks up the monopoly of the Big Six with community-owned generation, that tackles fuel poverty by reducing the need for energy and relies on the free “fuel” of the sun, wind and tides. Now we need a government to implement that energy policy, one that doesn’t want to sacrifice our homes and communities for the profits of oil and gas firms while ignoring the pressing reality of climate change. You are currently browsing the The Northants Green Party Blog blog archives for July, 2014.